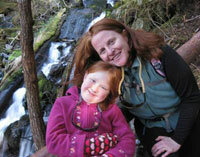 Dr. Karen and her beautiful daughter Abigail on a hike to Beaver Lake. That was the question I asked when a chiropractic office opened in the same professional building as our family’s pediatrician. I was about ten years old, and already knew about different types of doctors and their specialties, but I had never heard of a chiropractor. “Oh, they’re quacks,” came the reply. With all due respect for my mother, I thought to myself, “She must not really know.” I knew well enough that my mom would have had a lot more to say if she had much knowledge about the subject. Ever curious, I resolved to keep my eyes open for more information on this thing called chiropractic. Fast forward about eight years, my first year in college. Enrolled at the University of California as a biology major, I was looking into a career in health care. My interests lay in health and fitness, and also in the healing power of nature, so I had a few options. I considered midwifery and nutrition, herbalism, even teaching yoga, but discarded each possibility as either being too hard to make a living, not autonomous enough, or having hours too difficult for someone who needs to sleep at night. Then, I discovered chiropractic. Through my research, I realized that here was a health care discipline which was science based, but honored the innate wisdom of the human body’s own healing capacity above all else. This seemed like a perfect fit for me, but I still had never met a chiropractor, nor had any experience with chiropractic. Dr. Karen performing a gentle neck adjustment. Next came the car accident. Driving home from UC Berkeley one rainy day, a kid in a Mustang ignored the stop sign. My Datsun was pushed across the yellow line and into the telephone pole across the street. Thank goodness I was wearing a seat belt, but that was when my back pain started. After a few weeks the pain didn’t go away; in fact, it got worse. On the recommendation of a friend, I made my first appointment with a chiropractor. The doctor’s examination was the most thorough I had ever experienced with any health care provider. I could tell he was interested in finding, then fixing the cause of my pain. It made perfect sense to me, a mechanical approach to a mechanical problem. What could drugs do to fix a problem caused by colliding with a telephone pole? After my first amazing adjustment, I was pain free. My chiropractor then explained that pain is only one indicator of the condition of your body and that it takes time to heal damaged tissues. I wanted the damaged joints to heal as completely as possible with their proper motion and integrity intact, so I followed his advice of several more adjustments and simple home exercises over the next eight weeks. My injury healed completely, and I was sold on chiropractic. I had confirmed my calling, with the help of a little divine intervention in the form of a spacey guy in a Mustang. As a biology major, I was already studying the basic sciences such as organic and inorganic chemistry, along with the physics and biology courses I would need for my entrance into Western States Chiropractic College in Portland, Oregon. During my four years at WSCC, coursework included biochemistry, a major emphasis on anatomy and human physiology, X-ray, diagnosis, clinical nutrition, chiropractic adjusting techniques and patient care. Here was all the science my little heart desired, focused on helping people access the innate healing power and wisdom of the human body. I graduated from WSCC in 1995. Today, I love being a chiropractor more than ever. It is my privilege to have the opportunity to help people heal without drugs or surgery. Although I respect traditional medicine for its ability to respond to emergencies and certain specific health situations, I am a committed proponent of natural health care. I am deeply grateful for my profession and for the community of Sitka, where I have been practicing happily since 1998. Married since 1999 to Paul FitzGibbon, a social studies teacher at Mt. Edgecumbe High School, we are blessed with a beautiful daughter, Abigail; who was born at home, is unvaccinated, and has never taken a course of antibiotics. If you’re curious about our choices or if that sounds interesting to you, please feel free to ask us about it. Addicted to studying, I regularly read journals and clinical information to keep up with new developments in natural approaches to health care. I attend continuing education to expand my skills in chiropractic, functional nutrition, and rehabilitative exercise, primarily focusing on yoga and yoga therapy. In practice, I strive to deliver the best in personal and professional care. A careful listener, I take time to understand your individual situation and concerns. I respect your body and work to help you achieve your health objectives, whether you are seeking symptom relief or long-term wellness care. How much you wish to benefit from chiropractic care is always up to you. I strive to deliver the best in personal and professional care. If you’ve read this far, you know that I’m dedicated to natural health care and chiropractic. My passion is helping people improve the quality of their lives in harmony with natural principles. This simple, sustainable way of maintaining health has been the focus of chiropractic since its inception. I hope to continue sharing this art and science of chiropractic with the community of Sitka for a very long time. If you’d like know more about our practice, look around our site for answers to your questions. If you’d like even more information, or to ask how we would approach any of your health concerns, please feel free to contact us. If you are a current patient and practice member, thanks for reading this far and sticking with us! Most of all, thank you for trusting us with your care, and for allowing us the opportunity to be of service. We promise to continue working hard to earn that trust. Be well.